Little Jimmy Dickens performs on the Grand Ole Opry. Grand Ole Opry icon Jimmy Dickens, 92, is set to begin three weeks of short-term radiation treatments for a pre-cancerous condition on his vocal cords next week. The Opry member’s doctors expect him to make a full recovery. 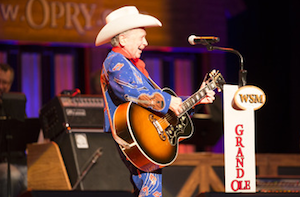 The entertainer has been unable to perform on the Grand Ole Opry stage for most of this year. His most recent scheduled Opry appearance was on Dec. 22, 2012, and he also made a surprise appearance on the Opry stage on April 12.